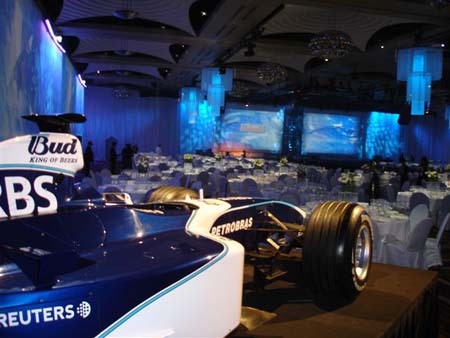 The Grand Prix Ball 2006 was held at Crown Casino's Palladium ballroom. The dinner this year featured a fashion parade, Human Nature and Leo Sayer. Lighting designer and operator Tim Newman also headed up CLS crew in installing a large quantity of CLS trussing, hoists and rigging. The main lighting instruments were 12 x Martin MAC2000, 16 x MAC700, 16 x MAC600, 50 x ETC Source4, 5 x Griven Kaleidio, 20 x LED Pinspots , 12 x Honeycomb LED wash lights, 36 x Thomas Pixleline, 4 x Lycian and Selecon Followspots all under the control of CLS's new MA Lighting grandMA.